Nowadays people are as likely to reminisce about the bad Christmases when everything went wrong and everyone behaved badly as they are about the good ones. The frankness is helpful: the conventional image of an idyllic time for the ideal family makes Christmas time a crushing burden for people whose experience of Christmas has been of deprivation, conflict and misery. It is always good to know that hard experience has been shared. Perhaps, too, bad Christmases take us closer to the spirit of the first Christmas. The Gospels present the first Christmas as the Birth of the Messiah. Whatever people of the time imagined that a Birth of the Messiah would be like was systematically unlike the Scriptural accounts. They would have imagined important things happening to important people in important places in edifying circumstances. Their imagining would certainly not have run to a rocky engagement which the man almost called off on discovering that his fiancée was pregnant with a child that was not his. Nor would it have included a long march to fill in tax forms, having to sleep on the streets and to give birth in a paddock, suffering an invasion of smelly and disreputable shepherds and odd foreigners, an undignified flight in the middle of the night and eking out a life as asylum seekers in Egypt. But that of course is the point of the Gospel stories – that when the God who comes into the world goes beyond the margins of the acceptable to include outsiders. God defies polite expectations. To unsympathetic observers this birth took place on the wrong side of the blanket and the wrong side of town. In the Gospel stories the good news is that God includes everybody, and the celebration of Christmas nudges us to do the same. Perhaps that explains why when later generations worked on the stories of Christmas they went beyond the main characters to give faces to people who had only a marginal role. The innkeeper was given a face, the three Magi were given crowns, character and names, animals came into the field, Joseph and Mary found themselves with a servant boy, and Mary discovered a mother and father. Of course a few marginal characters were left out – those such as Elizabeth and Anna who disappear from the story. Also those who were necessary to make things happen: think of Mary’s chaperone when visiting Elizabeth, the camel driver of the Magi, the tax officials and the owner of the land on which Mary gave birth. The Christmas stories are about inclusion. If the Christmas story goes out to the edges to include people who are excluded or neglected, it may be that bad Christmases echo it more faithfully than Christmases that go smoothly. The shady family members who turn up uninvited and drink us out of house and home, the unresolved sibling rivalries that flare, the pressures at the end of the working year and of pre-Christmas buying, and the power failure that warms the beer and liquefies the ice cream recall the organisational disarray of the first Christmas. They remind us that mess and inconvenience are signposts to the places in our lives and world where God wants to be invited and to which Christ came. Perhaps that is why on Christmas Day so many people want to be close to people who are disadvantaged at Christmas, why they leave their homes to cook, serve meals and entertain at shelters and in hospitals. It is also why the images of torture in CIA prisons, of detention on Nauru and Christmas Island and of destitution in our cities are so confronting. They are the really bad Christmases. The contrast between the hospitable world that Christmas evokes and the bleak brutality of the world that politicians devise is striking. The Christmas story invites us to do something about that. I was reading an article just yesterday about the Wayside Chapel's Christmas and this was part of Rachelle's story: "I've been coming to Christmas every year for the past 15 years, mostly as a guest because it's so hard to get a spot as a volunteer. It's so popular everyone wants to volunteer." Those words echo Andy's premise: the Christmas story goes out to the edges. And sometimes the edges are neat family homes in 'good' suburbs. For me, it's a story of hope and the breaking-in of a God who loves us beyond all reason. I am hoping for no power failures, as my cooking is challenged enough. But I don't mind if my son and son-in-law have their usual clash over the table tennis kingship. And an 8 month old baby is going to be spoilt! Frankly attempts to overclothe Jesus in not mere, swaddling clothes but in 21st century socio-economic reductionist and PC piety overlooks/trivialises the centrality of uncluttered dogma of faith: John 1:14 14 And the Word became flesh and dwelt among us, and we have seen his glory, glory as of the only Son from the Father, full of grace and truth. Jesus was born into a crazy, wonderful and awful (simultaneously), screwed up world and therein lies the hope of redemption. Dickens had a lot to do with the popularisation of the sort of Christmas we now have but he was as much, if not more, into compassion and charity as celebration. The message is still there, loud and clear, for all those who have eyes to see and ears to hear. 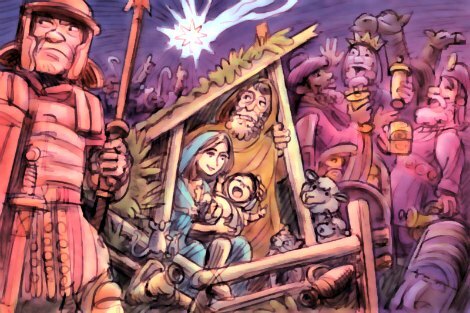 On the other hand, Fr JG, Andrew's reflection removes the Nativity from the cartoon-style depictions we get today, into our REAL lives, where everything is not so cute and sanitised. I like a God who can cope with our REAL world. John George comes across like the uncle who sits in the corner of the family Christmas party reminding us about what Christmas is really all about, as if we didn’t already know. Andrew’s essay, on the other hand, assumes the truth of what John George is saying from the outset. At a time when it seems Peace and Goodwill would be helped by diminishing emphasis on the things that divide us, it seems contrary for Christians to promote a belated tradition implying that God intervened in human history to establish His Religion and so undermining the claims and beliefs of others. The closest Jesus came to referring to his birth was when a woman cried out, 'Blessed is the womb that bore you', and his reply was dismissive. There was no celebration of his birth among the early Christians until Christianity, centuries later, displaced Mithraism in the Roman Empire, and the supposed birthday of Mithra was adopted by Christians as that of Jesus, along with some of the myths associated with Mithra. The driving force behind the early Christians was the great and universal love and acceptance for all, which suffered when Christianity gained political power as the official Religion of the Roman Empire. It is that early spirit of love and acceptance we need to get back to, if there is to be Peace and Goodwill on earth. Could I recommend a little "examination of conscience" to Fr George? His comment reveals what most of his "posts" show: a tendency to use the bludgeon rather than Charity in his responses. Just because others see the world a little differently does not make them wrong. If only Fr George could reveal -- even just ONCE -- something to match the sagacity of Dr Hamilton, together with a little charity, his responses would be more rewarding. In synthesis: The Word became flesh and dwelt among us (The Gospel of John - Fr JG).To unsympathetic observers this birth took place on the wrong side of the blanket and the wrong side of town (Andrew Hamilton). Amongst people who had great faith in God the Father, like Iraqi Christians. John George again comes to the rescue with a splendid exegesis of the Christmas story written in his own inimitable prose. .
Dear Doctor it is not a sin to vehemently disagree[Truth in clarity is truth in charity]-Jesus used such often [being no yes-man! ]: Matthew 25:41 “Then he will say to those on his left, ‘Depart from me, you cursed, into the eternal fire prepared for the devil and his angels." My conscience is clear after examen thanks Doc, how is yours eh? A reflection on Incarnation by Fr Richard Rohr online. Jesus said, “You must lose yourself to find yourself” (Matthew 16:25). ..... most people have presumed that the self that had to die, the self we had to lose, was the physical self, when actually Jesus meant the ego self, the self-created by our own mind ... ... There seems to be some deep bias against embodiment, materiality, and physicality. ......Christianity is the only religion that believes that God became a body, a human being: Jesus. Christmas is the Feast of the Incarnation or “enfleshment.” For most Christians, though, Jesus is totally divine, but not totally human. We deny his humanity and overly assert his divinity—instead of the very synthesis that Jesus exemplified, announced, and shared ! ...when we can’t put it together in him, we can’t put it together in ourselves .... You and I are simultaneously children of heaven and children of earth, divine and human coexisting ...We are a living paradox.... Most Christians were simply never told THE REAL GOOD NEWS that flesh and spirit, divine and human, coexist. .......Matter always reveals Spirit, and Spirit lies hidden in all that is physical, material, earthly, human, flawed, and failing. Mr Liddy sir beside Jesus explicit reference to nativity[John 18:17]: Re Christmas in Times of Persecution. 'It is known that the Feast of the Nativity was observed as early as the first century, and that it was kept by the primitive Christians even in dark days of persecution. Catacombs of Rome contain evidence that they celebrated the Nativity. The opening up of these Catacombs has brought to light many most interesting relics of primitive Christianity. In these Christian cemeteries and places of worship there are signs not only of the deep emotion and hope with which they buried their dead, but also of their simple forms of worship and the festive joy with which they commemorated the Nativity of Christ. ... these primitive Christians painted on the walls the figures which gave them the most pleasure. The subjects of these paintings are for the most part taken from the Bible, and the one which illustrates the earliest and most universal of these pictures, and exhibits their Christmas joy, is "The Adoration of the Magi." cf Dawson, William Francis Christmas: Its Origin and Associations Together With Its Historical Events and Festive Celebrations During Nineteen Centuries. Time to stick to the 'revealed Script'... Happy and Holy Christmas! !